My movie going experience was enhanced today because my brand new husband went with me!! For those of you who did not know, One week ago today I got married! Going forward from time to time my husband may attend the movies with me making my reviewing experience more fun!! Finally “Molly’s Game” has opened. I have been waiting for this movie for months and it does not disappoint!! 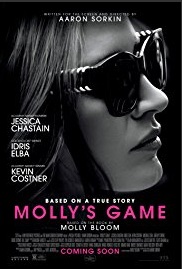 “Molly’s Game” is based on the true story of Molly Bloom (Jessica Chastain), an Olympic Down-Hill Skier who ran the most exclusive “High Stakes Poker Game” operation for over a decade before she was arrested in the middle of the night by the FBI. Molly’s players included some of Hollywood’s Royalty, Sports Stars, Big Business Tycoons and unbeknownst to her, members of the Russian Mob. “Molly’s Game” is awesome!! It’s suspenseful, intriguing and edge of your seat entertaining. I love Jessica Chastain and she does not disappoint!! She makes it up as she goes along. The only down turn of the movie was there wasn’t enough “poker play” shown. Molly’s Game was worth the wait. You should check it out!! “Downsizing” has an impressive cast, too bad the movie wasn’t as impressive as it should have been. The end of the movie is very anti-climactic. The movie starts off Ok, but after the first hour, the movie tanks. It does not make sense. It’s all over the map and becomes boring. This was supposed to be a Comedy, but I never laughed once. If you are a “Die-Hard” Star Wars fan, you will love “Star Wars Ep. VIII: The Last Jedi”. The movie is EPIC in its delivery and covers a lot of ground. There is plenty of thrilling action, super-cool special effects and breath-taking cinematography. There are a lot of twists and turns which helps to keep a long-running (2:32) movie interesting. A bit more of the “Dark-side” surfaces in this installment. This is the middle installment of a Trilogy. The door is open and set for the third installment. Mark Hamill does an excellent job paving the way for the new younger “Skywalkers” to come. I actually saw “Just Getting Started” Friday evening, but it was so bad and I had other things going on that I didn’t think it was urgent to post a review. 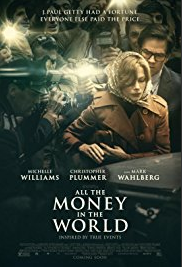 I don’t know if the actors in this movie needed money or if it was just the idea of making a movie that drew them to this project. The story was silly, lazy and did not make sense. There was some humor, but it was short-lived. I actually fell asleep not once but TWICE!! The movie was only 90 minutes long, but it was a very painful 90 minutes. The jokes are dry, the humor is stale and the overall movie is just plan goofy. This is one of the worst comedies I have ever seen. This is a 0 Star Movie!